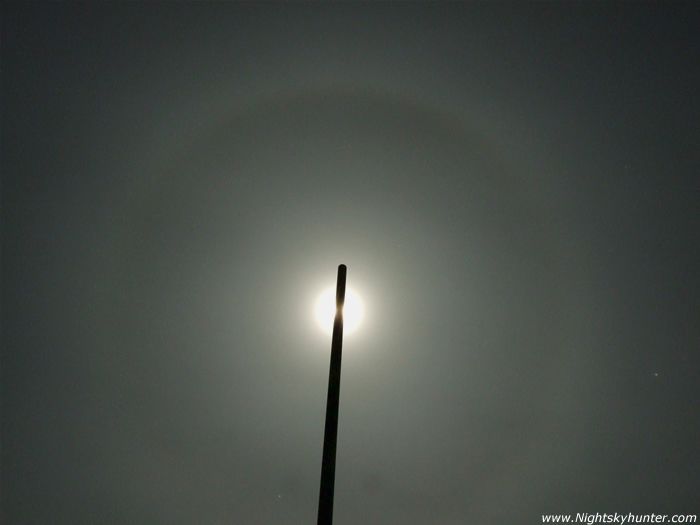 Another image of the complete 22 degree moon halo on Jan 21/22nd 2008. This time I used a lamp post at the entrance to my estate to subdue the glare of the full Moon. Sometimes sun and moon haloes can be a good indication of the weather. In folklore they were always a warning sign of bad weather which may arrive up to 24 hours later in the form of a frontal system. This is not always the case but it proved true tonight because by dawn a warm front arrived in producing rain which has not stopped yet at the time of writing on the afternoon of the 22nd. Perhaps they are accurate after all. 30 second exposure at ISO800 at F/7 using the 28mm setting.